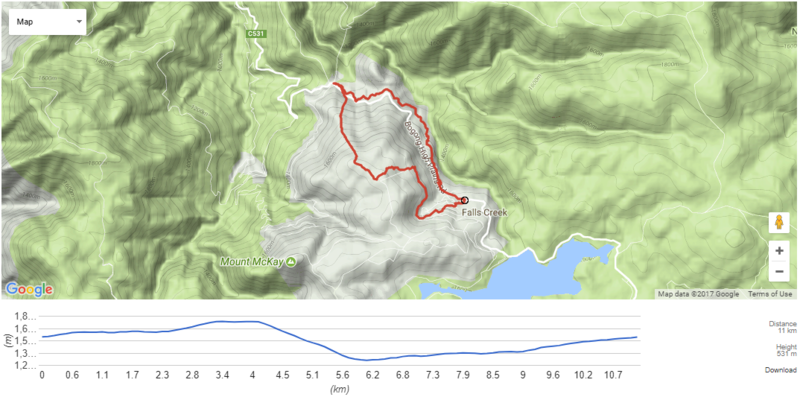 Falls Creek is a unique offering when it comes to alpine trail running. Combining a diverse range of trails with its beautifully appointed village and iconic tourist landmarks, Falls Creek brings together accessibility and convenience with challenging rewards for all abilities. The trails at Falls range from flat well-manicured walking and vehicle tracks to rugged and remote singletracks through extreme alpine terrain. Heritage sites like Wallace’s and Cope Huts join the spectacular features of Rocky Valley Lake, Mt McKay and Frying Pan Spur in an enviable sightseeing aspect to the trail offering. To be part of the group, run in Falls during January when the cream of elite Australian distance running come to take advantage of the cool climate and 1600m+ altitude training benefits. To book accommodation at Falls Creek visit fallscreek.com.au. "A gentle introductory run that scoots you out to serene Rocky Valley Lake via the sweeping ‘Walking on Water’ trail and returning via the resort’s Aqueduct Trail. Mostly graded underfoot with a reasonable incline to begin." TRAIL HIGHLIGHTS: Traverse through woodland on Walking on Water Trail, bomb down to dam, dam wall run. MAPS AVAILABLE: Falls Creek Alpine Resort Maps (representative); www.fallscreek.com.au/Maps; Bogong Alpine Area 1:50,000 (SW Maps). Starting at the Visitor Information Centre, run up Slalom Street through the village for about 100m until you reach the Falls Express liftline above you. Turn hard left up a small grass incline and follow the trail to the left. You will pass some snow barriers on your left as you start the climb up Walking on Water Trail. Keep to this side as the trail soon diverts off the main run. Pace yourself up here as the ascent continues, crossing over the Aqueduct Trail (on which you will return). Keep following the signs for the Walking On Water Trail, which bears left at the clearing and eventually joins Mt McKay/Pretty Valley Road. Run along this dirt road for a short way before a brief climb up the Tank Trail to the right on a wide single-and-a-half trail. You will come to a short non-technical descent that eases you down toward the lake – nothing too steep and worth a bombing run down before hitting unsealed Pretty Valley Road again, with a carpark adjacent. Follow the road on, eventually hairpinning around and down to the lake’s edge. Before hitting the dam wall you can turn left towards a toilet block to pick up the Aqueduct Trail. Alternatively, it is worth the run across the dam wall, the bitumen stretch made up for by the huge views down Rocky Valley Creek and across the lake towards Bogong High Plains. Another bonus for effort is the ensuing slightly technical run downhill when you reach the end of the wall and double back under it. Crossing in front of the dam wall there is a trail to be made out, which drops down before a short incline takes you back up to rejoin the start of the Aqueduct Trail. From here, simply follow the aqueduct (a grey pipe alongside a gravel trail. You will soon cross the Bogong Alpine Way – take care when crossing, and eventually reach one several exits down to the village, starting with the Walking On Water trail that you started off on. You can otherwise continue on the Aqueduct Trail to stretch the legs further with exits at Parallel Street and Schuss Street. "A moderate out and back run with a halfway highlight of standing at Ropers Lookout for big views back to the resort and the Kiewa Valley. A great warm up for the Black run and a simple extension to the Green run should you have plenty in the tank. " Starting at the Visitor Information Centre, run up Slalom Street through the village to begin up to the Aqueduct Trail. When you hit the Aqueduct trail take a left following a gravel fire trail until you hit the Bogong Alpine Way. Taking care, cross over and continue along the same trail into the Nordic Bowl cross country area. After 300m take a left onto a fire trail and follow this until you hit the dead end where there are water pumps. From here there is small scramble up some rocks to the stone water pump station below the dam wall. Turn left here to follow the trail. This is undulating terrain with a small climb up until you hit the intersection where the sign in and out book is for cross-country skiers. At this intersection (3.5km into the run) turn left following the signage to Roper Lookout. It’s a windy, rocky, undulating but fun single track run for 1.7km and 80+m of vertical gain to the top, which rewards you with stunning views of the ranges, Kiewa Valley and Resort. Vista enjoyed, turn around and run back the same way, this time stay high and run over the dam wall enjoying views across Bogong High Plains, Mts Jim and Jaithmathang. Just off the dam wall, hook right towards the Nordic bowl to once again pick up the Aqueduct Trail, taking you back to the village. You can choose to drop back into the village on a number of trails leading down from Aqueduct Trail, beginning with the Walking On Water Trail (into the back of Slalom Street), or Parallel Street or Schuss Street exits. "This route is an excellent Black run, shorter than most Black Routes but offering a fair bit of elevation gain and loss, and ranges from beautiful distant views of the surrounding mountains through to steep, technical running surrounded by thick forest and trickling streams, starting and ending at a very cosy, easy to use facility." ESTABLISHED TRAIL NAMES: Slalom Street, Aqueduct Trail to Wishing Well, Home & Away trail, Frying Pan Spur Trail to Ticket Office/YMCA Gate, Packhorse Heritage Trail. GEOGRAPHIC REFERENCES: Slalom Street, Aqueduct Trail, Wishing Well, Home & Away trail, Frying Pan Spur, Trig Point, Packhorse Heritage Trail. TRAIL HIGHLIGHTS: Historic Interpretation along Packhorse Heritage Trail; views of Mt Mackay and Spion Kopje; high alpine meadows; technical single track; variety of flora and terrain; passes Falls Creek Falls. From the Information office run up Slalom Street toward the Home & Away Link Trail. Join Aqueduct trail and follow this around Village Bowl and under both Summit and International lift lines. After 2.4km of flat running you will arrive at the Wishing Well (a pool on your left) and turn left onto the back-end of Home & Away trail (i.e. you passed the start of this trail 2km ago). Follow this trail for 1.2km, climbing up some short zig-zags into a high, undulating meadow that follows a small creek before hitting a spur line which leads you to Frying Pan Spur. At a track junction (just after a large, dead tree on your right), turn right onto Frying Pan Spur Trail and head toward the obvious highpoint (knoll). After approximately 550m you will come to a Trig Point (note the metal tripod) which affords great 360 degree views. The next part is the hardest navigation of this route so be sure to turn right and head almost north down an obvious but poorly-marked spur. There are sporadic treated pine bollards which are marked and if you look up and through the trees you will see perfectly straight, blackened power poles, left over from before the fires that ripped through the area. Over the next 1.6km you will descend 450m through alpine grasslands that transition into thick re-growth and finally stands of large alpine trees. At this point, turn left at the management trail and follow this to the road, past the ticket booth and down toward Howmans Gap Alpine Centre and the YMCA entrance gate. Just before the gate but after the ticket booth you will see a sign noting the Packhorse Heritage Trail. Turn right at the sign and follow the trail 4.2km to return to Falls Creek Info Centre. The trail once used by early cattlemen and surveyors to access the Bogong High Plains. parallels the Bogong Alpine Way and offers great interpretation signs that discuss the landscape and effects of the fires. This is a great trail, all single track, that offers a couple of escape points and some great running.